11.12.13 ~ Today I am thankful that I didn't have to go anywhere, because we received well over a foot of snow! I could not believe how much snow we got last night and this morning...remember that magical feeling you used to get when you saw that first snowfall every year? Well, age is making me bitter I think, because that magical feeling is now replaced with disgust and irritation! It was pretty though, I must admit. 11.12.13 PRIZE: I do like snow around the Holidays however, and Studio M (carried only at the midwestern chain Meijer and manufactured by Color Club) has a nice Holiday collection called Sparkle & Shine. My camera refused to focus well on these, probably because of all of that sparkle and shine! The green shade on the left is a duo chrome that flashes purple, and the others are pure glitter bombs! 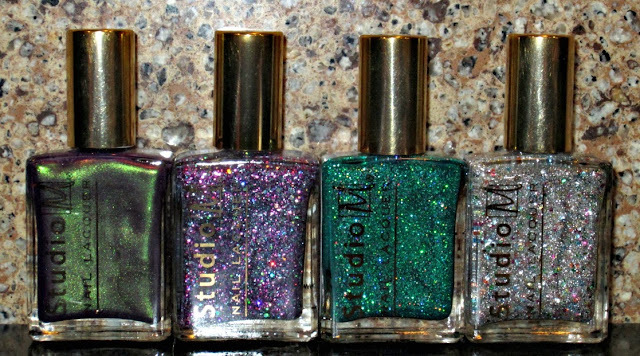 One follower will receive the 4 selected shades above from the Studio M Sparkle & Shine Holiday Collection. Please read the rules below for entry and exclusions. Today I am thankful that my cat slept in my bed for about an hour this morning. She has sinus issues and since it's gotten cold, she's been pretty much living in the bathroom too keep warm because I keep it a bit warmer in there than the rest of the apt. She hasn't slept with me at night for several weeks & I've missed her. so this morning was special, even if she snores like a freight train now. Today, I'm thankful for wine!! I'm thankful the snow we got yesterday didn't stick! They are really sparkling,like the snow! Today I'm thankful for my morning coffee, it tastes so good! Today I am thankful for a place to call home as there are so many who don't. Thankful for my sweet girls. They always brighten my day! Today I'm thankful for my mom! Today I'm thankful for payday! And thank you for the giveaway! I am thankful for coffee in the morning. I'm thankful for my dad and how helpful he has been over the years. Today I'm thankful for my puppies - they always snuggle when I need some love and their love is unconditional! Today I am thankful for vacation days so I can take a long weekend trip with my mom! Today I am really thankful for warm jackets. Today I'm thankful that we have a big freezer stocked with food. 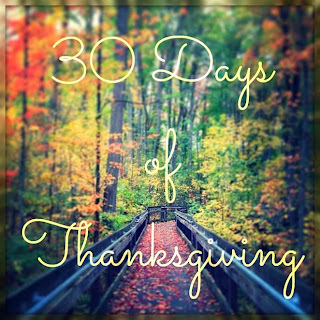 So thankful today! I had a little medical problem yesterday and today it has turned out a lot better than I thought it would. So grateful! I'm thankful form my code finally working for my job today! Today and everyday I'm thankful for my kids who always make my day. I am thankful that I have a job in a field where it is so difficult to find a good and worthwhile one. I am thankful that I got up this morning to a beautiful day and to see my daughter. Today I'm thankful for coffee. I haven't had it in a month or two.